Businesses love blogging. According to HubSpot, 50% of marketers say blogging is their top content marketing priority. In 2018, more than 4 million blog posts were published per day. This statistic includes both consumer and business blogs, but any way you shake it, this amounts to a lot of clutter. With so many blog posts and so little time in the day for your prospects to read them (as many as 43% of people admit to skimming blog posts), it’s clear that your content marketing strategy should include a few other tactics. In this post, we will review some content alternatives to the supremely ubiquitous blog post. While most of these content elements can be featured on your blog or website, they share a few essential characteristics. They’re designed to go beyond your company blog to reach audiences on closed platforms like Facebook, LinkedIn, and YouTube. They’re eminently sharable and therefore most (but not all) of them are image-based (e.g., infographics and memes). They drive awareness of and interest in your product or service without necessarily linking back to your website. They offer valuable information that isn’t already being written about ad nauseum (or, if it is, then you’re presenting it in a unique and/or novel way). Without further ado, let’s get to the content! Hubspot reports that over 50% of consumers want to see videos from brands. And since visual content is more than 4 million more likely to be shared on social media than plain text, video is a great way to reach consumers outside of your company’s website. Creating high quality, compelling videos has never been easier. There are companies that exist to help you create a variety of different types of videos – from explainer videos to sales tools to demo and brand videos, the sky’s the limit. Videos created in-house are also popular with consumers. Hubspot reports that consumers show a preference for authentic (e.g., lower quality) video from brands versus higher quality (and seemingly inauthentic) video which can be perceived as artificial. It’s not enough to simply create a video or two – some planning must be involved to successfully deploying video content on a site like YouTube where 400 hours of content are uploaded every minute. Caesars Palace, already a well-known brand, wanted to reach people who may have heard of them but weren’t paying customers. They created a successful personalized video campaign that drove a 15% increase in brand favorability and a 200% increase in search lift within its target audience. Caesars used consumer surveys to understand how people perceived their brand. The feedback they received also helped them understand their core demographic’s interests and passions. Armed with this information, they created a video campaign focused on what their target audience loved. Namely, travel, food, sports, and music. 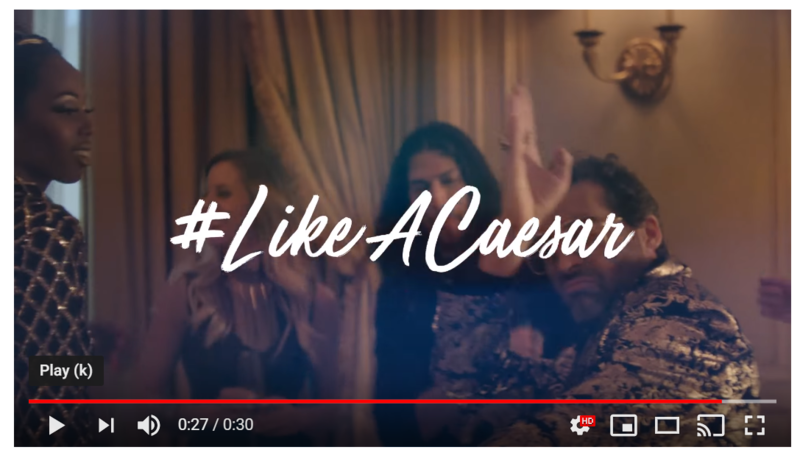 Caesars created a 30-second video with a brand message that they customized using YouTube Director Mix, a tool that allowed them to mass customize this one video – resulting in more than 150 variations of messaging. They then used the Google Ads platform to target its desired audience as well as affinity audiences (people who had a demonstrated interest in travel, food, sports or music) as well as other targeted audiences. The campaign achieved a 60% video view-through rate (the industry benchmark in travel is 42%) and over 11 million minutes of watch time. LinkedIn: Native video on LinkedIn is fairly new, but it’s a great place to reach business professionals, particularly those in the the B2B space. To leverage video on LinkedIn, you can add it in a blog post via LinkedIn Publisher. You can also record and upload videos on LinkedIn via their mobile app. You can also include a video in your LinkedIn status update which will show up in your followers’ feeds. Your Newsletter: Have an internal email list? Then use it to share your latest and greatest videos. Depending on your goal with the video, you can point readers to your website, Facebook page or YouTube and encourage readers to share. Tumblr: Micro-blogging site Tumblr may not be the first place you think of when you’re looking to share your videos, but with over 300 million registered accounts and native support for video posts, it’s another opportunity (outside of your own blog) for you to share your content. Instructables: If you have a DIY or how-to video then you can share it on Instructables, a website whose sole purpose is to show people how to do stuff. Launched in 2006, Instructables started out with a few hundred projects and now boasts hundreds of thousands. Infographics use charts, icons and graphics to succinctly communicate Information. Social media posts that feature infographics get 3 times more engagement (e.g., likes, shares, and comments) than those that don’t. 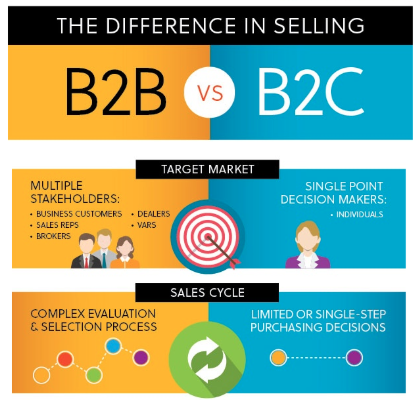 Below is an example of an infographic that illustrates the difference in selling to B2B markets versus B2C. Note that this is only a portion of the full infographic. Infographics can be large and often serve as a standalone piece of content, but small portions of larger infographics can be easily shared on social media and used to entice people back to your website to view the entire piece. Infographics, by their very nature, tend to contain highly specific, deep content (as opposed to shallow, generic content). While they can be shared on the traditional social channels – many of which I’ve already mentioned – they can and should be newsworthy. Infographics with titillating statistics, research results, and great visual appeal have the potential to be picked up by news outlets, exertal blogs, and other websites. You can help this along by defining your target audience (e.g., data technology professionals), then targeting influencers in this market with the goal of getting them to feature or link to your infographic. 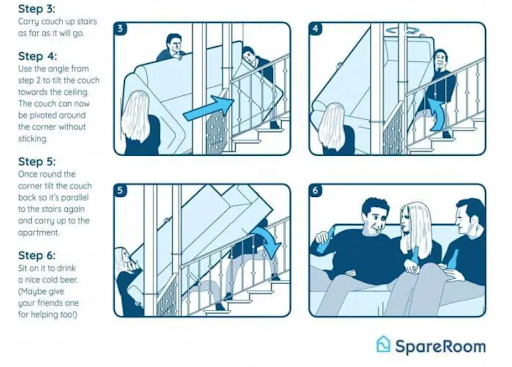 SpareRoom did this very successfully when they created an infographic designed to show how Ross and Rachel (from “Friends”) could successfully move a couch upstairs (using math). The infographic was featured in a Washington Post article intended to be helpful to college students who might find themselves in a similar situation. Pinterest – Pinterest has 200 million monthly users and, of these, 2 million post pins every day on the platform. Two-thirds of pins come from businesses, and Pinterest users value these posts, using the platform to search for brands and plan purchases. Since infographics are so visually compelling, Pinterest is an excellent place to promote and share them. Slideshare – Slideshare from LinkedIn is a knowledge platform that enables businesses to upload and share slide decks, infographics and other documents with an audience of 80 million professionals. Slideshare boasts a wide range of content from experts across dozens of categories. It’s not unusual for a piece of content to get hundreds of thousands of views on SlideShare. This tutorial on artificial intelligence got over 1 million views! Publications/News Outlets – People love clever, attractive infographics that clearly communicate something newsworthy. So if you’ve gone to the trouble to create a compelling piece of content like this, you can try to get it featured with a well-known publication such as Fast Company which has an infographic of the day section. Generally, you’ll need to contact the publication’s editor to pitch your infographic idea, but it can be well worth it if your content gets featured. Memes are humorous images or videos that tend to get shared often and can even go viral. Adding humor to your marketing materials can seem daunting, but if done thoughtfully, authentically and professionally, it can pay dividends in terms of social sharing and awareness. Memes are ready-made for social platforms and are particularly compelling to younger consumers such as millennials. Figure 4: Example of a Meme Created by Barkbox – Image Source. There’s no secret sauce to marketing a meme or making it go viral. Memes are perfect for sharing on just about every social platform including LinkedIn and Pinterest. Memes can be featured in your company newsletter or sent out in an email to clients and prospects just as easily as they can be shared on your company facebook. The trick to successfully incorporating memes into your overall marketing strategy is the content of the meme itself. And, the best way to demonstrate this, is to show you a few great examples of organizations that nailed it. 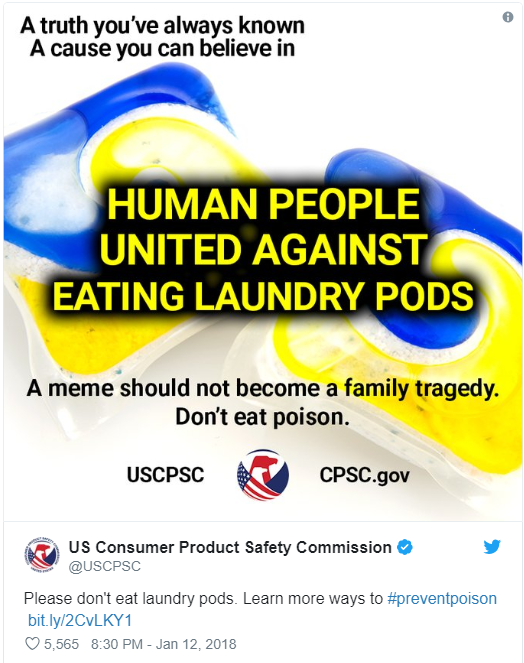 Meme created by the US Consumer Product Safety Commission to educate people about the dangers of eating laundry pods. Notice the hashtag #preventpoison in the caption? 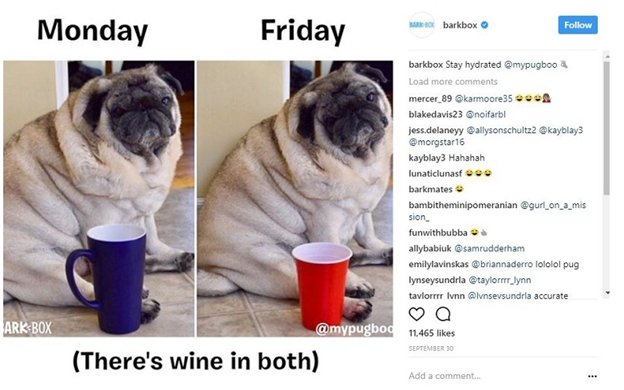 Associating a meme with a unique hashtag is a great way to broaden its reach on social channels like Instagram and Twitter. 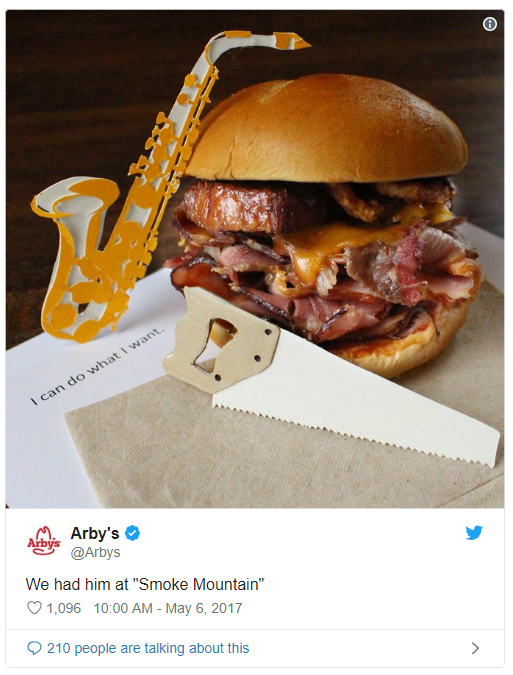 Well, I don’t know if Arby’s nailed it here, but this meme has a lot of engagement so we’ll give it to them. 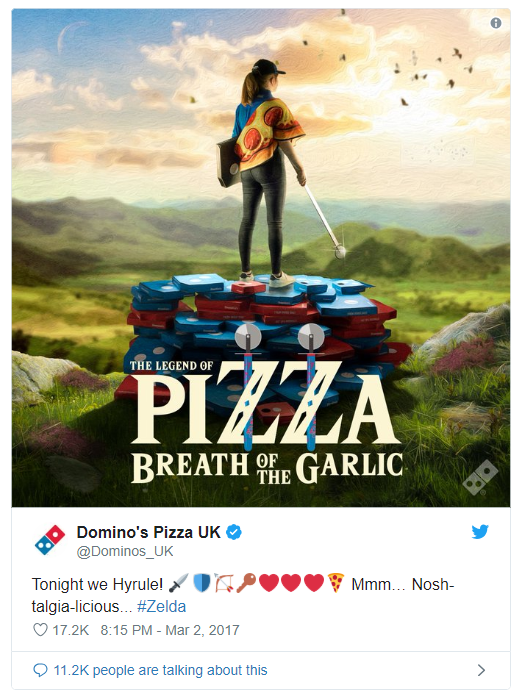 This Domino’s combination ad/meme plays on the popularity of Legend of Zelda game, “Breath of the Wild” – a successful ploy to reach a common audience. Memes thrive on social platforms such as LinkedIn, Facebook, Twitter, Pinterest, Snapchat, and Infogram where images take center stage. So once you create your meme, don’t hesitate sharing it often and widely. Whitepapers offer an authoritative way for companies to share their expertise in a more official and detailed way than a blog post. Whitepapers contain specialized information meant to educate prospects and existing customers about a complex issue or problem. They can be featured on your website as an incentive to generate leads (e.g., Download our whitepaper on Integrated Data Protection Appliances), promoted in a blog post and shared via an external source such as findwhitepapers.com. Whitepapers can become the foundation of an entire lead generation or marketing campaign. They are a piece of content that sparks more content. For example, Hootsuite created a whitepaper aimed at educating businesses about how to use social media. They created a landing page with the goal of getting people to give up their personal information in exchange for the whitepaper. 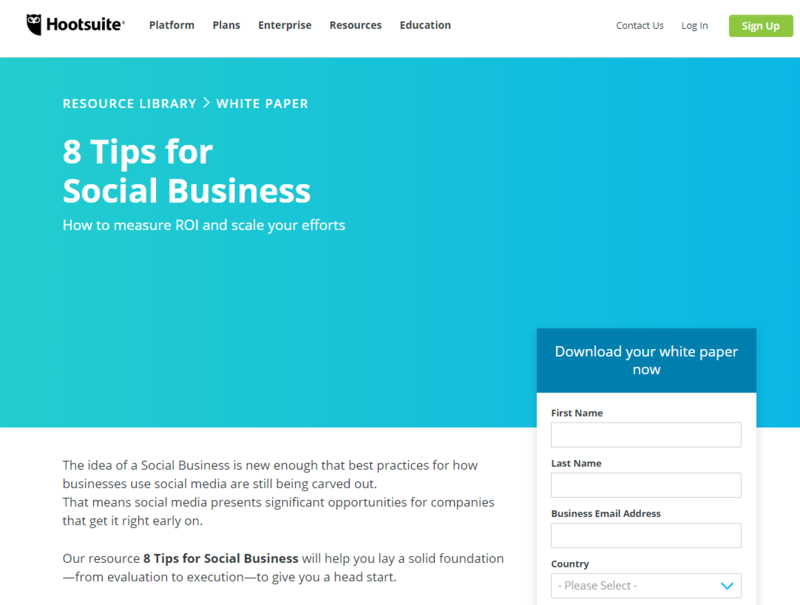 Figure 8: Hootsuite’s whitepaper landing page. This whitepaper may not be a great example of unique content since there’s a dearth of content online about social media for businesses. So consider your audience and your topic, and make every effort to create something that your prospects will find valuable (and worth sharing). Your existing audience – White papers can be shared on your blog, with existing clients, and with your newsletter subscribers. You can also feature some partial content from your whitepaper on sites like LinkedIn and SlideShare. TechRepublic – If your white paper is technical, then you can list it on TechRepublic, a resource library of whitepapers created by vendors in the technology sector. According to their website, TechRepublic has nearly 38 million unique monthly users, 47% of which are business decision makers. Another alternative to the on-site blog post is the off-site blog post or article featured on a blog or publication’s website that has an established audience. Writing an article aimed at educating businesses about a specific topic is a great way to get in front of people without paying for traffic. It’s also a good way to get quality links back to your website since most publications included a byline with an author bio and link to the author’s website. Industry-specific publications – Industry publications are a great place to start when trying to find external sources to publish your articles. Start wherever you get your own industry news, or ask your clients the top three or four sources where they get their news from. Since just about every company has a blog and everyone needs fresh content, it’s actually not that difficult to locate a few sources. Once you identify a source, reach out to the editor or submit a cold pitch (many sites have a “write for us” page that provides detailed information to would-be contributors.) If you can’t find the page, consider doing a Google search such as “write for marketing land”. I did this and immediately found their guest contributor page. LinkedIn – LinkedIn has a professional user base of over 590 million people and a wealth of different ways you can share your content. Businesses can post content directly to LinkedIn via their built-in publishing platform (just click on “write an article” from the status bar. You can also link to an article you’ve written (either on your blog or elsewhere), making this a status update which goes out to all of your contacts. And for those businesses with an advertising budget, LinkedIn offers paid ads and ways to boost your content. Medium – Medium is a blogging and syndication platform with over 60 million monthly readers, and this includes business readers. Medium’s platform is supremely easy to use – making it a breeze to import existing content or write and publish new content on the platform. Medium users like to spend time with the content there, spending an average of 4.5 hours per month reading articles. This makes it the perfect place to share longer form content such as an article or blog post. 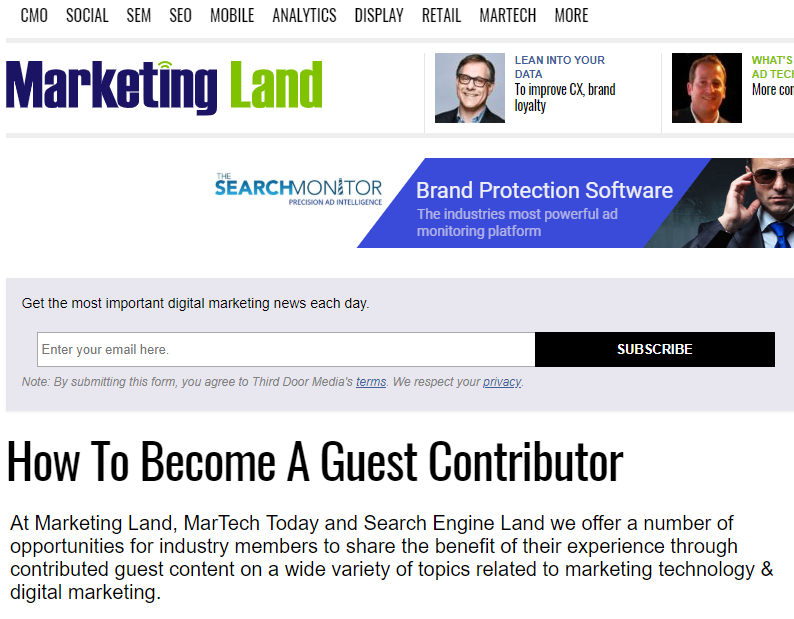 Figure 9: This is a partial screenshot of Marketing Land’s guest contributor page. Twitter – Another great source for finding guest article opportunities? Twitter! Most editors have a Twitter account and many of them link to their submission guidelines. 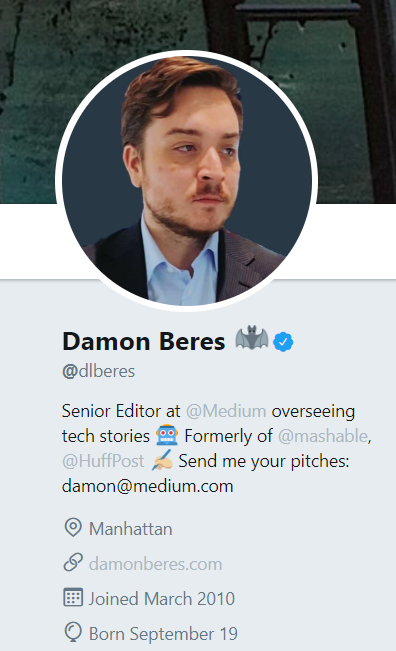 You can “hack” Twitter by typing “pitch me” in the search field and selecting “People” from the results. Then you’ll see a list of people accepting pitches from various different publications. This is kind of the wide-net approach, so if you have a specific publication or blog you’d like to contribute to, your best bet is to first see if there’s a guest contributor page like the one from Marketing Land, or search for editors from that publication on Twitter to see if they’re accepting pitches. Blogging isn’t going away anytime soon, but it shouldn’t be your only content marketing tactic. By incorporating different types of content into your overall marketing strategy, you can reach audiences outside of your blog. Visual content such as infographics, memes, and video can help you expand your brand’s reach even if it doesn’t initially drive traffic to your website. This type of content is consumed widely on platforms such as Facebook, Pinterest, and LinkedIn – and it’s inherently mobile friendly. Creating content using a variety of styles, lengths, and mediums will help you reach the most people without getting lost in the clutter of a million blog posts. Published on 02/06/2019 by Ryan Gould. Ryan Gould is the Vice President of Strategy and Marketing Services at Elevation Marketing. From legacy Fortune 100 institutions to inventive start-ups, Ryan brings extensive experience with a wide range of B2B clients. He skillfully architects and manages the delivery of integrated marketing programs, and believes strongly in strategy, not just tactics, that effectively aligns sales and marketing teams within organizations.Ryan is known for taking complex marketing and business challenges and developing solutions that simplify processes while driving customer outcomes and business value. He also thrives on guiding Elevation teams toward execution of strategies that help companies succeed in new verticals, while staying true to core values and brand integrity.